Fab 50 vs Festive 50 – 2017 Readers Poll? It’s that time of the year again, where we moan about how Fanning’s Fab 50 isn’t what it used to be. John Peel had the right idea with the Festive 50 – choose 3 favourite tracks released in the past year. We’d love to hear Dave play a show of his favourite tracks of the year. Anyway if the readers of a certain blog were to email, tweet or facebook their top 3 we could come up with our own Festive 50 to be published round about when Dave breaks out the eggnog. Anyone up for it? Getting a complete list of Fanning sessions is almomst as elusive as the holy grail. Meanwhile here is a list of Irish acts who recorded sessions for the late great John Peel. Some of these have been released officially on the Strange Fruit label and I may start tracking down a few more of those that didn’t. If a band recorded more than one session the number of sessions recorded follows in brackets. The names are linked to the BBC page for that artist. One day RTE might take a leaf out of the BBC’s book. Corrections welcome, e.g. missing bands or those incorrectly flagged as Irish. From Dublin The Vipers were Paul Boyle (lead vocals, rhythm guitar) George Sweeney (lead guitar), Brian Dolan (bass, backing vocals) and Dave Moloney (drums). They recorded a Peel Session on 27th Feb 1979 and this repeat broadcast of the session is from 17th April 1979. The tracks recorded were ‘You’re On Your Own Kid’, ‘Playin’ The Game’, ‘Too Rough’ and ‘You’re So Strange’. We have two tracks from the session with John Peel’s intros and outros. Also getting a mention in these clips are Terri Hooley and The Undertones. Thanks to the Peel Wikia for this recording. While we are on the subject check out Dublin punk bands on facebook courtesy the Come Here To Me blog. It is hard to believe that seven years have past since John Peel left us so suddenly. Thanks to the folks over at the John Peel Wiki there is no shortage of John Peel material to listen to, their efforts and those of Ken Garner have long been an inspiration round these parts. On 13th October 2005 John Peel night was celebrated in The Hub, Dublin with performances by 3 acts who featured on John Peel’s BBC Radio 1 show. House of Mexico, Female Hercules and playing their first gig in 13 years Hey Paulette featured along with DJ sets by Leagues O’Toole and The Dudley Corporation. The image above is from a postcard that Niall McCormack of Hitone created for the night and lists all Irish bands who recorded sessions for John Peel. The Hot Press review of the night can be found here. See also Pat’s 2010 John Peel Day post ‘Peeling In The Years‘. Thanks to Laura for kicking this all off. A week ago, a comment on the Dublin Opinion post “GREAT IRISH BANDS, PART 29: THE WOULD BE’s” asked about a song played by John Peel on the BBC World Service in February 1996. The song was by Pillow and apparently was a new single from Would Be’s founder members Mattie and Eamonn Finnegan. After some detective work the poster managed to track down a recording of the song but further details have so far proved elusive. A couple of excellent articles in the newspapers this weekend by Nick Kelly and Sinead Gleeson have given me cause to think of Derrick Dalton and by extension the music of his band Hey Paulette. 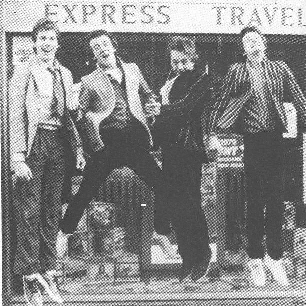 In the case of this band it was John Peel and not Dave Fanning who was to first bring them to our attention. 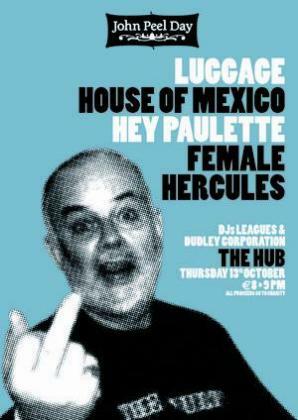 On 13th October 2005 Hey Paulette reformed after fifteen years to pay homage to John Peel at a John Peel tribute night. Derrick died two years ago but to celebrate his life, his wife Laura James has organised a benefit gig in his honour. The gig is tomorrow night in Whelan’s and features The Dinah Brand (which count Stephen Ryan ex The Stars of Heaven and The Revenants) alongside Thread Pulls, Richer Than Astronauts and Little Beauties. The €12 admission includes the Aeromodeller album ‘First Flight’ and an unreleased copy of Crumb’s ‘Like Goodbye’ single. All proceeds go to Aware.